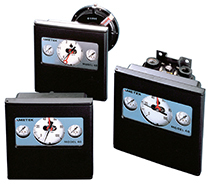 AMETEK-PMT Model 40 Pneumatic Pressure Controllers automatically position a valve or other final control element to maintain process pressure at the desired set point. The Model 40 Pneumatic Controller works as a receiving controller that can control any process variable transmitted as a pneumatic signal. The units are available with control modes of 100% proportional, 200% proportional plus resent, and 300% proportional plus reset, plus rate (PID) for processes with frequent load changes. They have been tested and meet and exceed the EPA Quad Zero requirement <6 SCFH bleed rate when used on natural gas supply. Standard models have proportional band adjustments for controlling processes where load changes are infrequent and can be corrected by the manual reset feature, standard in every controller. They have large, easy to read dials. Field calibration is easy on this units, by a simple screwdriver adjustment, the standard proportional controller can be changed to on/off control action with adjustable differential gap. The basic instrument is also available as an indicating pneumatic transmitter. Mounted close to the point of measurement, it transmits an air pressure signal proportional to the measured variable to another indicator, recorder, or controller. The Model 40 product line has a lead time of 4 weeks or less, and are Made in the USA at our Horsham, PA manufacturing plant.